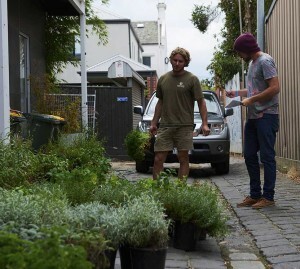 Sam from Creative Earth Landscaping and Phil Withers (Phillip Withers Landscape Design), met today at the 5×4 site and made some planting decisions about which edible plants will go where and in what order within the 5×4 planter boxes. While Phil Johnson (Phillip Johnson Landscapes) designed the garden with the help of Phil Withers, Sam will maintain the plants in the coming weeks and educate Ralph on how to best care for them. Phil Withers, collaborator of Phil Johnson Landscapes, talks with Sam from Creative Earth.